Week 1 – starting 31st January. This week my animal of the week is the Nyala. 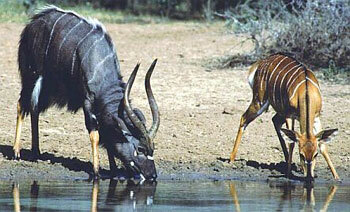 Nyala are only found in South Africa although they are abundant in the parks and Game reserves. Male and female are easily distinguished with several major differences. Male Nyalas are almost twice as big as the females, they also carry large dangerous horn which the females do not possess and the biggest difference is the skin colour. Males are browny black whilst females are orange, they however both have white stripes across their body. They live in in medium sized herds of around 20 – 50 of which are around 10% male. Like most antelopes males which haven’t won a herd will form bachelor herds. Fights are minimal and the males territories overlap vastly. They are always willing to drink and to hang around with other herds. They can fall prey to Leopard, Lions and Hyenas but males will defend herds using their powerful horns.